I’m in the sprawling metropolis of Houston, Texas, and it is indeed feeling like New Jersey: 53 degrees and drizzly. Walking into the headquarters of Texas Crude Energy, the first thing I notice is how much smaller the office is than expected. The second is the disarming personality and dry Texan humor that has seeped into the company’s Southern California-bred president and CEO, Peter Fluor. You wouldn’t know it by the three-story office building and its modest team of 40 employees, but this is the nerve center of an enterprise that holds its own with some of their Texas neighbors, America’s energy behemoths. It’s also the home base of Speedway Stable, a venture started by Fluor and his partner and friend K.C. Weiner in the fall of 2014 that began with two splashy auction purchases of ready-made runners and has quickly blossomed into a multi-faceted racing and breeding operation. 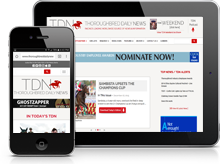 And it’s not difficult to draw connections between the efficiency and ingenuity that established Texas Crude and the principles that have now entrenched Speedway in the Thoroughbred world. Though they each come from an oil background, they took disparate, winding roads into their profession. They also both had horse-related backgrounds, but took decades to return to the equine. Now they’re in it. For good. Peter Fluor was born in 1947 in Pasadena, California, the son of J. Robert Fluor, who ran Fluor Corporation, an engineering and construction company started by Peter’s ancestors. In addition to running his business, Robert was commissioner of racing in California for several years and owned a few Thoroughbreds. “Growing up in the Pasadena/Arcadia area, I could hear the calls at Santa Anita when they would turn the volume up for the featured race,” Peter said. With a little enticement, the elder Fluor got his young son to come out with him to the backstretch of The Great Race Place. Some of those early childhood memories prominently feature one of the sport’s all-time legends. Robert Fluor owned horses with Hall of Famer and California racing god Charlie Whittingham, who took a liking to his son. When Fluor was a teenager, his father bought El Rancho Murrieta in Murrieta, California, a 160-acre ranch turned commercial racing operation. His partner on the deed was Charles Weiner, father of K.C. Eventually, the real estate started to become more expensive and the friends grew too busy to justify the investment, so they sold the ranch to a developer. Fluor’s father maintained an interest in several horses, one of which turned out to be Alleged, a three-time champion in Europe who scored back-to-back conquests of the Prix de l’Arc de Triomphe in 1977 and 1978. After graduating from the University of Southern California, Fluor went to the East Coast to try to break into finance, but was put off by the Wall Street culture and instead returned home to accept an offer from a family friend, driving to Texas with everything he could pack in his two-door car. K.C. Weiner was born to a successful geologist in Midland and took a circuitous route to his Houston office. He did a semester abroad in Spain and ended up staying for a year and a half, working as a dishwasher and cook in a resort town. It was only due to political upheaval that Weiner returned home to Texas. Weiner soon realized he didn’t want to be a lawyer and took a job as an oil field and land man to make some money while he figured out what was next. The needle was definitely moved in the late 2000s, when Texas Crude essentially changed its industry forever. The company got in on the ground floor of the Eagle Ford Shale discovery in South Texas, one of the landmark developments in the history of oil and gas exploration. In 2000, shale gas, found trapped in formations of the common sedimentary rock, made up only 1% of U.S. natural gas production. By 2010, after Eagle Ford exploration got underway, it was 20%. Government forecasts say that number will rise to 46% by 2035. But it took some outside-the-box thinking from the lean operation of Texas Crude to get into this first big shale play before the energy giants did. Texas Crude drilled the first well at Eagle Ford, allowing the company to buy up land there before the boom hit. 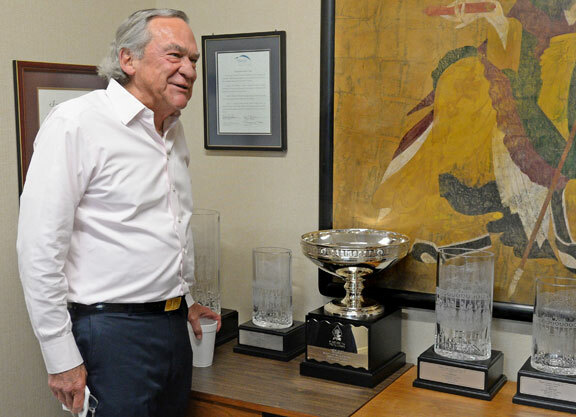 Fluor and Weiner’s breakthrough windfall in Eagle Ford led directly to Speedway Stable when Fluor, with his family’s future secured, decided after three decades to re-enter the racing world. Click here to read the rest of this story in the December TDN Weekend.